Amnesty International condemned the decision as a “backward step in the fight against impunity and a betrayal of victims of serious violations of human rights.” The group also noted that, regardless of the AU decision, the ICC retains the ability to investigate sitting heads of state and government officials of African states that have ratified the Rome Statute. 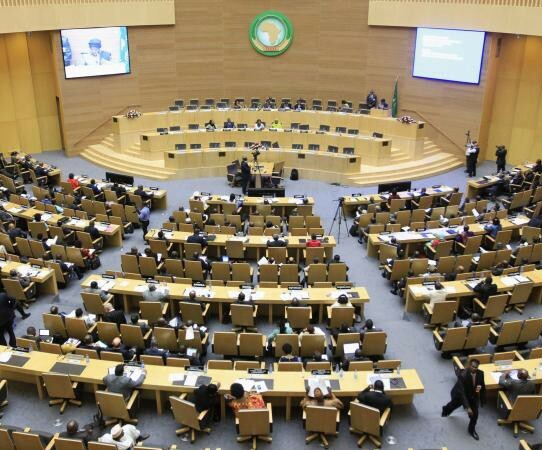 The proposal for the expanded African Court must be ratified by 15 AU member states before it takes effect. The UNDP, the UN Peacebuilding Fund and the World Bank are working together to fiscally support the Central African police forces. A Daily Maverick columnist argued that the Ugandan military’s engagement with Seleka forces has made it a major player in the CAR conflict. The International Bar Association called on Kenya to reconsider its stance on granting immunity to sitting heads of state and government leaders accused of grave crimes. Kenya’s attorney general said that the ICC has all the documents it needs for the Uhuru Kenyatta trial, and the Kenyan government asked ICC judges to reverse their order to compel witnesses to testify in the trial of William Ruto and Joshua Sang. Russia offered to provide Kenyan police with counter-terrorism training and said that it supports local solutions in Kenya instead of the ICC. A Darfurian victim represented by International Justice Project lawyers spoke with the ICC focal points on non-cooperation in New York. The UN secretary general ordered an internal review of UNAMID after the ICC prosecutor called for an investigation of allegations that the peacekeeping mission covered up Sudanese war crimes. Meanwhile, Sudan denied Médecins Sans Frontières access to a South Darfur displaced camp. AFP reported that after 25 years in power, Omar Al-Bashir’s regime has done much harm to Sudan. Amnesty International urged the Netherlands not to return three ICC witnesses to the DRC for fear that they face torture, unfair trials and imposition of the death penalty, but Dutch immigration authoritiesdenied the witnesses’ asylum requests, finding that they could be safely returned to the DRC. Human Rights Watch (HRW) condemned UN peacekeepers and Congolese forces for failing to intervene in an attack that left 30 civilians dead even though they had prior knowledge of it. ICC Prosecutor Fatou Bensouda explained why the OTP did not bring charges against three intermediaries accused of witness tampering in the Thomas Lubanga case. Congolese Prime Minister Augustin Matata Ponyo said that his government is working to stop sexual violence and bring perpetrators to justice. IRIN reported that much more needs to be done to stop the recruitment of child soldiers in the DRC, in addition to rehabilitating victims. Avocats Sans Frontières declared its continued support in protecting NGO workers and rights defenders in the DRC. After clashes with the Seleka militia in the CAR that left around 17 dead, the Ugandan army declared that the Seleka are now their enemies and that they allied with the Lord’s Resistance Army. The UN Security Council placed sanctions on a Ugandan militia for the alleged use of child soldiers and sexual and gender-based violence, among other crimes. The International Federation for Human Rights (FIDH), No Peace Without Justice and Lawyers for Justice in Libya condemned the assassination of Libyan activist Salwa Bogaighis. The confirmation of charges against Laurent Gbagbo reignited debate over the ICC’s approach in Côte d’Ivoire. The UN Security Council condemned a bombing that left one UN peacekeeper dead and six others injured in northern Mali. French Defense Minister Jean-Yves Le Drian said that the capabilities of terrorist groups in northern Mali have declined considerably since the French military intervened in the conflict. UNESCO is short on the funds it needs to restore cultural artifacts and mausoleums that were allegedly destroyed by Islamists in Timbuktu. FIDH warned that women in Nigeria continue to be targeted by the Boko Haram. The Nigerian military claimed to have intercepted a Boko Haram intelligence cell and made the first arrest in the case of the kidnapped school girls. The militant group was blamed for a bombing that killed at least 56 in Maiduguri. A group of human rights organizations appealed to Ukraine to extend the ICC’s jurisdiction to include events in Crimea and eastern Ukraine. The FARC outlined the final phase of peace talks with Colombia‘s government. Sweden implemented a new law that criminalizes genocide, war crimes, and crimes against humanity. The legislature of El Salvador and Parliamentarians for Global Action organized an expert session on the Rome Statute to clarify issues regarding ratification and implementation of the Statute. The Nigerian Coalition for the ICC pushed for Nigeria to ratify the Kampala amendments to the Rome Statute. The American NGO Coalition for the ICC argued that it is in Iran’s interest to join the ICC, although doing so would present the country with some challenges. Freedom House called on Ukraine to ratify the Rome Statute. Upon his resignation for health reasons, the ICC praised Hans-Peter Kaul’s 11 years of service. The ICC prosecutor established a scientific advisory board that will advise the prosecutor on scientific and technological developments and procedures. HRW detailed the physical abuse and torture of Syrian women detained by government forces.